All of a sudden some interesting 4x4s are popping up on eBay. Think British 4x4s and the only name that comes to mind is Land Rover. With good reason, too. Around the world Great Britain's Land Rover and USA's Jeep are the two names synonymous with tough 4x4s. But for awhile Land Rover wasn't the only British company trying to market a 4x4. Austin gave it a try in the late fifties through the mid sixties. 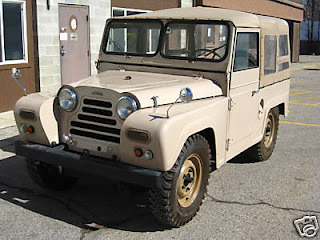 The Gipsy was built by Austin to compete with the Land Rover. Obviously it was also meant to look like a Land Rover. The suspension was more modern than the LRs, being independent and using something called "Flexitor" rubber springs. Oddly, later models used leaf springs. Austin built around 20,000 of these vehicles. When Leyland and BMC merged to form British Leyland, Austin and Land Rover became part of the same company and the Gipsy was killed off. The big problem with the Gipsy was rust and the vehicle being offered on eBay SEEMS to have very little. The seller mentions some small rust spots low on the body, but he also says it has had some bodywork done, so it might be worth inspecting this vehicle before buying it. This Gipsy needs some work, but nothing serious, and it appears to be complete. If I bought it I'd fix whatever needs to be fixed and then leave the rest alone. It looks great just the way it is, no modifications are needed. Completely impractical for everyday use, this would be an amazing vehicle to buy and present at car shows. It's guaranteed to attract a crowd (I have no idea how many car shows I've been to in my life - a lot - and I have never seen an Austin Gipsy). Click here to see the eBay listing for this Austin Gipsy. Click here to find the Austin Gipsy Site, the only site I could find dedicated to the Gipsy. First time reader of your blog and I am impressed! You have some pretty interesting choices on here, most of which I would have picked for myself. Nice to find a car geek who has similar, oddball, tastes!